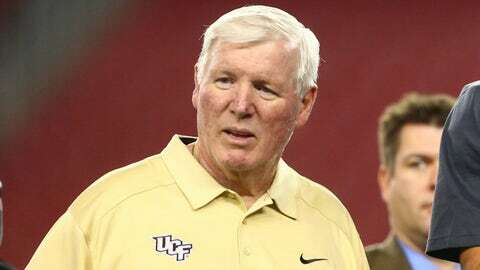 George O'Leary's tenure at UCF included a Fiesta Bowl victory in 2013 and a winless season in 2004. ORLANDO, Fla. (AP) — Following one of the worst starts in program history, George O’Leary is retiring as UCF’s football coach, effective immediately, the school announced Sunday. "In recent weeks there has been much speculation about the head coaching position at UCF and my future plans. Hopefully this statement clarifies the facts," O’Leary said in a statement. "After the 2013 championship season and Fiesta Bowl win I expressed my intention to retire at that time. After significant discussion with the UCF administration, I reconsidered and agreed to coach two additional seasons, 2014 and 2015. The administration has always been aware of my plan to retire after this season." "In an effort to allow UCF to accelerate its search for my successor and clarify the facts regarding my future plans, I am retiring effective immediately," O’Leary said. "This season has been difficult, and I support George’s decision to retire now so our program can begin planning for the future," Hitt said. Calling UCF "a sleeping giant" when he was hired in 2004, he succeeded in helping the school achieve national recognition both on and off the field.